Rheumatoid arthritis a holistic approach to dealing with Rheumatoid Arthritis. Demographics for this article and statistics about rheumatoid arthritis for this article are taken from rheumatoidarthritis.org. Demographics – rheumatoid arthritis affects women more than men, 3:1, 30 to 60 years of age, and is more likely if you have a family member who already has arthritis. Symptoms – common symptoms of rheumatoid arthritis are symmetrical joint pain, fatigue, malaise, fever, and joint destruction. Allopathic diagnosis – allopathic diagnosis of rheumatoid arthritis is based on three main factors: lab tests including positive rheumatoid factor, positive CCP, positive erythrocyte sedimentation rate, positive C-reactive protein, positive ANA, radiographs showing doing joint destruction, and positive physical diagnosis tests. Allopathic treatment – allopathic treatment for arthritis generally involves four things. It involves nonsteroidal anti-inflammatories, corticosteroids, disease-modifying antirheumatic drugs, and surgery. Side effects of nonsteroidal anti-inflammatory drugs include liver damage, heart problems, upset stomach, and kidney damage. Side effects of corticosteroids are like swelling, weight gain, increased blood pressure, mood swings, diabetes, increased infection risk, and osteoporosis. Disease-modifying antirheumatic drug side effects include liver damage and increased risk for infection. Side effects of surgery include possible infection, irreversible changes in the body, and even death (rare, but a severe side-effect). Natural treatment of patients with arthritis – natural treatment of patients with rheumatoid arthritis includes what we call a Triad approach. This means that we address structural issues, biochemical issues, and emotional issues. Structural issues are addressed with chiropractic, massage, physiotherapy including rehabilitation exercises and exercise in general. Biochemical issues of patients with rheumatoid arthritis include addressing gastrointestinal issues such as gastrointestinal function and food sensitivities as diagnosed by blood saliva or elimination, immune system issues such as chronic and stealth infections, hormonal issues such as thyroid and adrenal problems, and inflammation in general including the Cox two pathway. Emotional issues with patients are dealt with in an effort to decrease stress hormones and inflammation in general. It includes addressing external factors, meaning factors affecting the patient from the outside, internal factors, what we call autosuggestion, stress hormones, lack of exercise, and stress reduction techniques such as meditation. 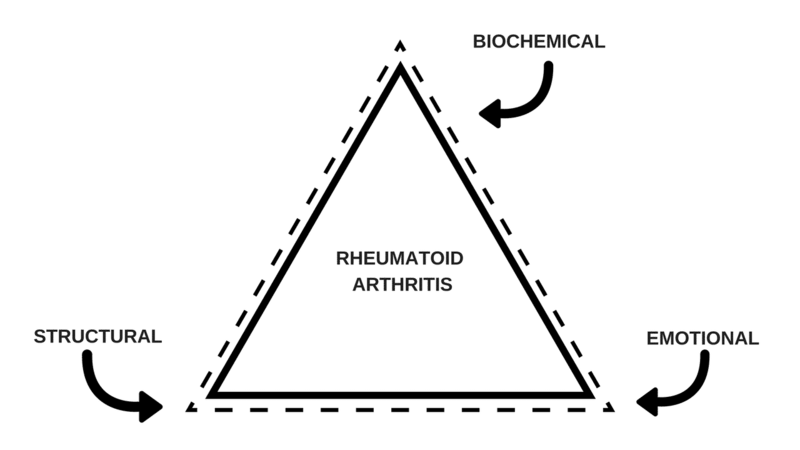 Results – using a triad approach to handling patients with rheumatoid arthritis addresses the three key areas that cause inflammation and joint destruction. Only by addressing these three areas can we get a truly holistic approach to dealing with patients with arthritis. In my own practice, I have seen that patients who deal with rheumatoid arthritis holistically have no side effects and are overall much happier with their care than they are with medical care for rheumatoid arthritis. Typical results are 60-80% improvement over 3-6 months as long as patients continue to adhere to their nutritional programs. To watch our YouTube video on click here! Click here to read more posts on Nutrition.